In Part II, we discussed the principles and consequences of Modern Monetary Theory (MMT). This week’s installment will be devoted to the importance of paradigms. Next week, we will conclude the series with a discussion on the potential flaws of MMT along with market ramifications. Every major shift in the efficiency/equality cycle has coincided with a favored economic theory to promote the change. 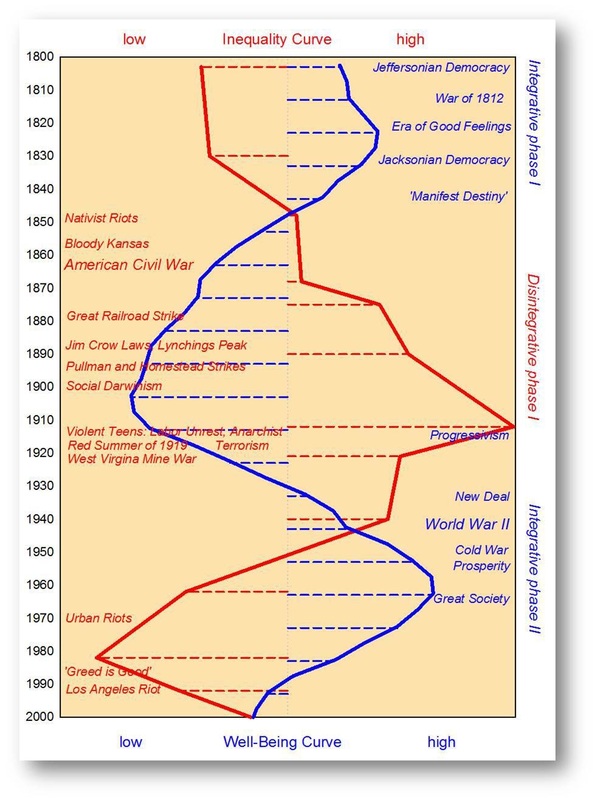 The following chart from Peter Turchin shows his take on inequality and wellbeing cycles in U.S. history. Although Turchin doesn’t fit his pattern to Arthur Okun’s equality and efficiency tradeoff, we see a strong match between this tradeoff and Turchin’s wellbeing and inequality cycles. During periods where Turchin’s wellbeing line is rising and inequality is falling, the economy is going through an equality cycle. 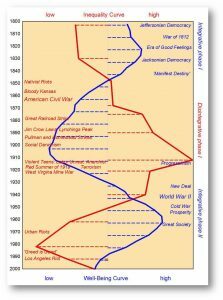 Equality cycles are sometimes characterized by policies that favor labor (which may include high marginal tax rates, easy monetary policy, policies that favor unions and social mores that promote “the common man”). Usually, equality cycles end when the economy needs to build productive capacity to reduce inflation and thus needs to increase efficiency. These are policies that favor capital, which may include low or non-existent tax rates, reduced regulation, anti-organized labor policies and social mores that lionize wealth. Our historical analysis suggests there have been four shifts in equality and efficiency and each has been supported by an economic theory that gave intellectual credence to the shift. Okun, Arthur. (1975). Equality and Efficiency: The Big Tradeoff. Washington, D.C.: The Brookings Institution. These reports were prepared by Confluence Investment Management LLC and reflect the current opinion of the authors. Opinions expressed are current as of the date shown and are based upon sources and data believed to be accurate and reliable. Opinions and forward-looking statements expressed are subject to change. This is not a solicitation or an offer to buy or sell any security. Past performance is no guarantee of future results. Information provided in this report is for educational and illustrative purposes only and should not be construed as individualized investment advice or a recommendation. Investments or strategies discussed may not be suitable for all investors. Investors must make their own decisions based on their specific investment objectives and financial circumstances.